Taking a ‘decentred’ approach to the analysis of health policy means being attentive to the historical contingencies and circumstances within which reforms are located, the influence of dominant or elite narratives in the shaping of policy, the local traditions and customary practices through which policies are mobilised, and the way local actors contest, negotiate and co-construct policy. 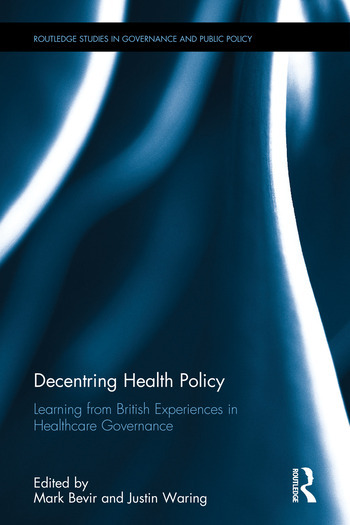 This book offers a unique analysis of the changing landscape of healthcare reform in Britain, as an example of decentralized reforms across the developed world. The collection is framed by the recognition that healthcare reform has resulted in variegated and decentralized forms of governance. The chapters look at distinct aspects of reform within the British NHS to bring to light the influence of local histories, traditions, coalitions, and values, in the remaking of a national healthcare system. Each chapter focuses on a different aspects of reform, and in others developing cross-national and comparative analysis. However, each offers a unique contribution and analysis of contemporary theories of healthcare governance. This book will be of key interest to scholars, students and practitioners in healthcare, health and social policy, political science, and public management and governance. Mark Bevir is Professor in the Department of Political Science, and Director of the Center for British Studies, at the University of California, Berkeley, USA. He is also a Professor in the Graduate School of Governance, United Nations University - MERIT, Maastricht, Netherlands, and a Distinguished Research Professor in the College of Arts and Humanities, Swansea University, UK. Justin Waring a Professor of Organisational Sociology and Associate Dean at Nottingham University Business School, where he founded and directed the Centre for Health Innovation, Leadership and Learning between 2012-2017, at the University of Nottingham, UK.